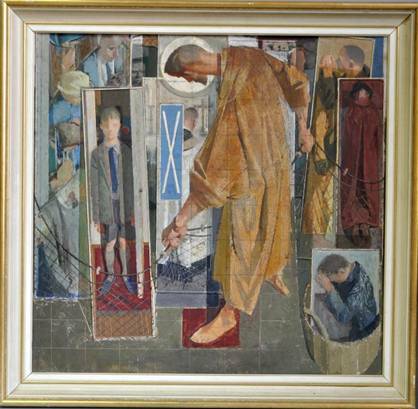 This very striking oil on board mural of `St Andrew the Fisher of Men` was originally painted by Norman Blamey OBE (1914-2000) for Ruislip’s Lutheran Church of St Andrew and it recently sold for £3200 against a pre-sale estimate of £600 at Wellers Auction House in Guildford. His approach to sacred and secular subjects was meticulous realism and in some he emulated early Renaissance masters with his use of crystalline geometry and one can also see a debt to Stanley Spencer. Only in recent years has he been given his due recognition.